4.9 (Based on 8 Reviews) 88% of reviewers recommended this product. So much better for planetary imaging that a barlow. Why? You can place this anywhere in the optical train without complicating your required backfocus. 5.0 very nice, unexpected benefits! Many Barlows make excellent fields and contrast. This is in the best rank for that, but it adds no in-travel penalty(super), no eye-relief push(meh), and no field loss for long-FL eyepieces...that effect is fantastic. some EPs actually gained field! I suspect the full-span glass gives you that awesome benefit.. A Tri-Mag is 5oz, and this is 8oz...a bit heavier, but this is not a monster weight.. Very valuable for my fleet of salvaged Japanese all-glass aspherics...beautiful planetary views. 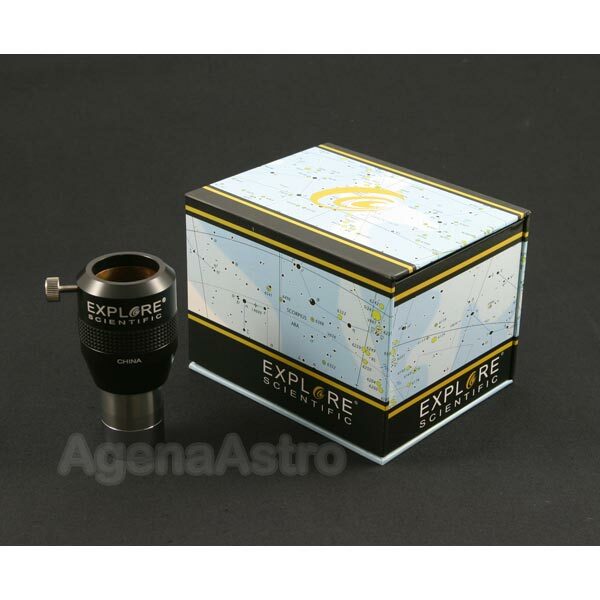 Spectacular optics from Explore Scientific and sold by Agena AstroProducts! 5.0 Great to have as a boost beyond your 2x barlow. This helps to boost magnification during great seeing. I have also used it for planetary astrophotography. Review by they call me "Mr. Jim". of Little Rock, AR. I bought this to help take my planetary imaging to the next level. So far I am very happy with it. Review by Starthrower of Southern New Hampshire. 5.0 Glad I stopped hesitating! This is an excellent Barlow/Focal Extender. I have seen no evidence of optical artifacts in its use. I wasn't sure I really needed a 3x, but after using it (I have the ES 2x) I feel its a great addition to my optical kit. It is heavy, however, just like all ES products, so be sure the weight of this with an EP will be manageable on your scope. Review by Mike in the Mountains of Berkshires, MA. Beautifully made and easy to add to any imaging train. This item makes placing the small planetary disks right on the center of the camera's sensor. Lightweight, too. Review by Astrobug of Portland, OR. In the few times I've used it, it puts my stable of regular Barlows (2" 2X GSO, 2.8x Klee, 3X Apogee, and 2X Orion Shorty Plus) to shame. None of the others perform acceptably with my 30mm Celestron Ultima (they all lengthen the eye relief, causing the apparent field of view to shrink noticeably, and the field stop becomes fuzzy). The ES 3X focal extender just disappears in use, as if whatever eyepiece you are using was magically placed into a longer focal length instrument; no adverse effects on eye relief, apparent field, or field stop sharpness whatsoever. No glare, ghost images, or scattered light were noticeable either. I primarily bought this to use with a DayStar H-alpha filter to achieve ~f/30, and it worked well here with my 80mm f/6.25 ED scope, even if it's a little less elegant than the 2" 4x Powermate that DayStar recommends. Fit & finish are superb, I am especially impressed by the lens coatings...it takes a bright light to even _see_ the glass surface, especially on the positive lens group that is nearest the eyepiece. The only cons I can see are the weight (about twice that of a typical 1.25" Barlow, but still manageable) and undercut (it's the ramp style, which I like better than the slot style, but I would prefer none at all). If there were a clever way to provide for a compact t-thread attachment like the Powermates, that would be nice for my specific solar application. But these are very minor quibbles. In short, ES has another winner here; performance closer to a Powermate at the price of a good 'standard' Barlow. I may have to get the 1.25" and/or 2" 2X versions. But first things first, my other Barlows are going up for sale!